Moto E4 Plus could be the next smartphone from Lenovo-Motorola. The device has been spotted on thee Federal Communications Commission website. 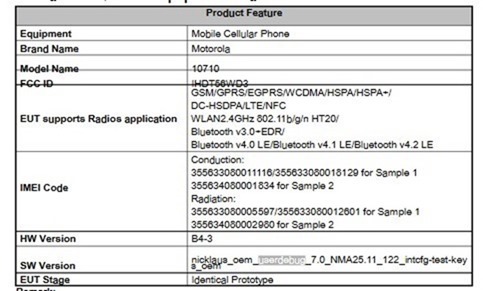 According to the FCC listing, these are the phone’s partial technical specifications. The Moto E4 Plus will support 4G LTE, Wi-Fi 802.11 b/g/n, NFC, Bluetooth 4.0/4.1/4.2, FM Radio and GPS. The device's sample IMEI codes show single SIM and dual SIM variants. This makes sense, because Moto's application for the certification mentions global adapter specifications for Europe, UK, US, India and Argentina, and some of these regions only retail single SIM Phones, while others such as our own Country prefer to have Dual SIM phones. The Moto E4 Olus will be backed by a 5,000 mAh battery, which if we are not mistaken, is the first phone from the Chinese OEM to feature such a large battery. The s/w version (software) which the phone runs on, is Android 7.0 Nougat, which we can see in the screenshot. It is mentioned as ".....userdebug_7.0_NMA25.11_122_” It is likely this is the build version which Moto used for the phone. Roland Quandt, who spotted the leak says that the Moto E4 Plus will be powered by a MediaTek processor, and will go by the model number XT 1773. It is unclear when the device will be launched, but given the application was filed just 2 days ago, we may have to wait a while to see if anything interesting materializes.